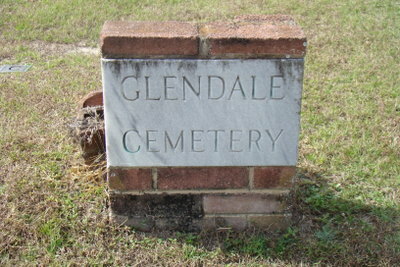 The Glendale Cemetery is located off Maxwell Road in Umatilla, Florida. 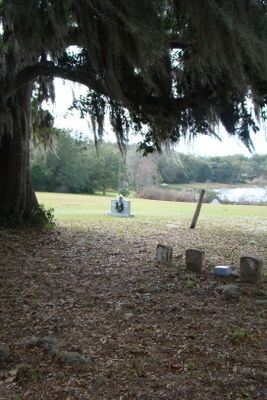 The cemetery was first started about 1863 and is still in use today. The list of people buried here reads like a list of most of the prominent pioneer families of Umatilla. Members present Lynn, Erin, Tracy and Shereen. We arrived at the cemetery at 9:00pm and got our equipment ready. The investigation was started at 9:15pm. We conducted a walk through taking baseline readings, EMF 0.1 and temp was 62 degrees. 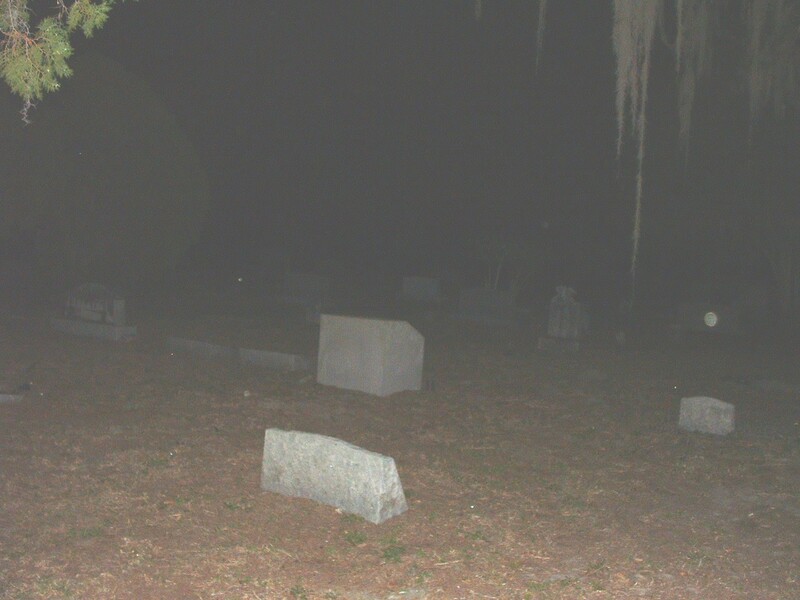 During this walk through I noticed that there was a lot of movement in the cemetery, nothing you could specifically pinpoint, just appeared to be a lot of motion in your peripheral vision. 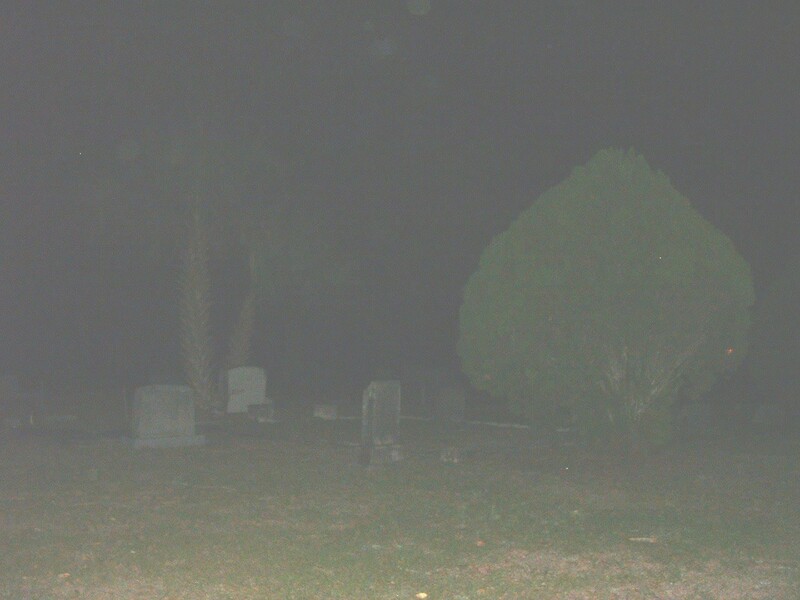 I one point about the middle of the cemetery, I thought there was a full body shadow but again this was a peripheral movement, and when I turned to get a full view it was gone. 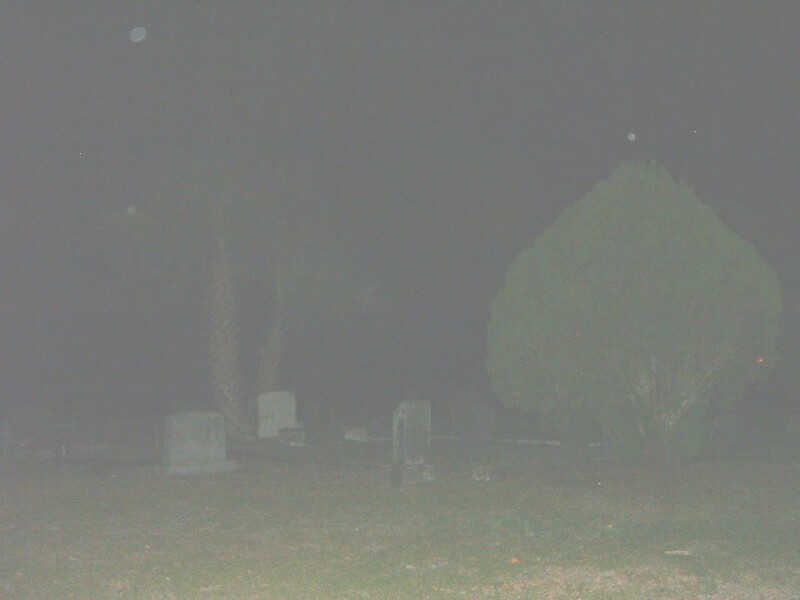 During the initial walk through there was one area to the right back of the cemetery that produced a temp ready of 43degrees, but we did not get any change in EMF readings or hear, see or experience any thing different to account for this. At the end of our walk through the group stopped for a break at about 10:30. At 10:50, we resumed our investigation and split up into two groups. Lynn and Erin took the back half of the cemetery and Tracy and Shereen took the front. In the front Tracy and Shereen picked staggered locations and took seats to sit and listen to the cemetery. 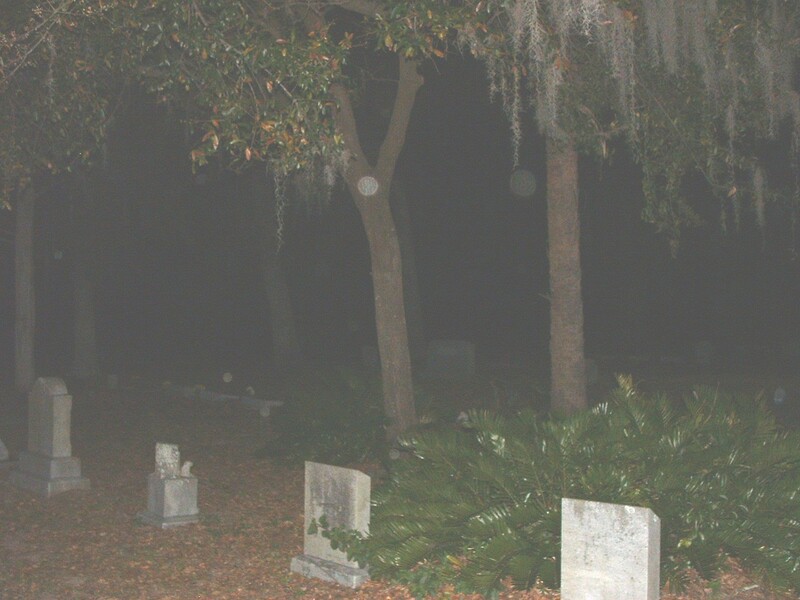 Again, once we quieted down, you became very aware of the impression of a lot of movement around you in the front of the cemetery, but again there were no changes in the EMF or temp readings and nothing specific was observed. During this time Tracy also reported the appearance of a lot of activity in the area where we parked our vehicles. She said that she had the feeling that something was about to come toward her from that area and at one time glimpsed what she thought was a shadow, but again it was quick and out of the corner of her eyes. At the same time Lynn and Erin, set up in the back of the cemetery. Erin reports that they set up by a new gravesite from earlier that day, but did not get any readings or feelings of any activity. Though she did report having the feeling that she was being watched at one point. At approximately 12:00pm, a car pulled up to the front of the cemetery, and three people got out. The two men gathered a camera and entered the cemetery, the girl stayed at the car. The two men walked to the back of the cemetery straight to what appeared to be a specific tombstone. (Albert ? B:1865 , not date of death.) They took several pictures of this tombstone, during which time Erin and Lynn made there presence known to them. They immediately turned and returned to their vehicle and left. At this time Lynn and Erin decided to move and set up further back in the cemetery. They reported that while sitting there next to some underbrush they noted a lot of movement, like thrashing about in this brush, they could not find a source for this noise but both felt it was likely a small animal causing it. At 1:00am the group again came together for a break period. 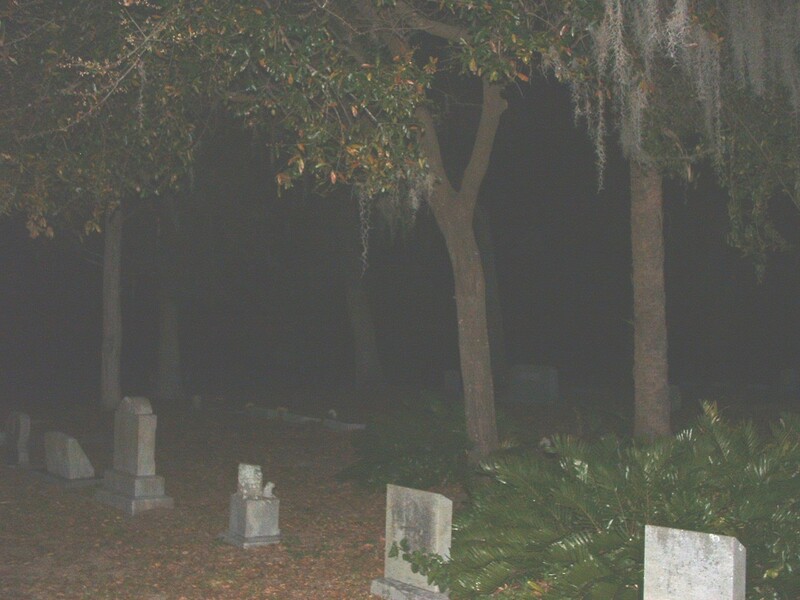 Everyone noted that they felt that with the arrival of the two men in the car there was a significant change in the atmosphere, from that point forward the cemetery had become very quite, with no movement or shadows. At 1:20 am the group proceeded to complete another walk through of the cemetery. Again there were no changes in EMF readings and the temp. had since dropped to about 50 degrees. We decided to end the investigation at 1:40 am and packed up our equipment. A review of all of our data did not produce much. 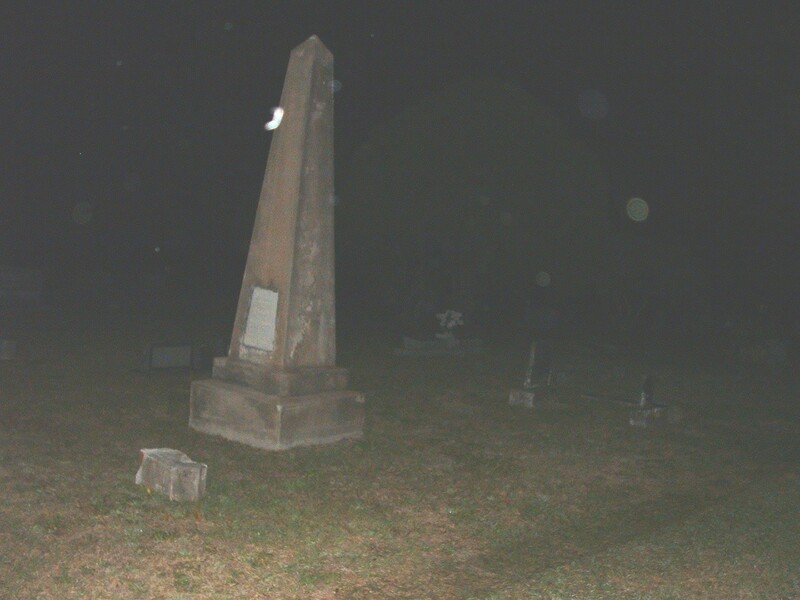 Several pictures of orbs were found and one white rod. The most notable thing about the pictures is that most of them were taken in sets of two simultaneously and one picture would show the anomaly while the next would not, which should then disqualify moisture, dirt and or insects. The general consensus of the group is that this cemetery gave the appearance of being very active due to the movement and noise, but nothing was obtained on the evidence, along with the feeling of being watched, possible shadow sightings by two different members we have to say makes this an interesting place to investigate and may warrant a further investigation at a later date. 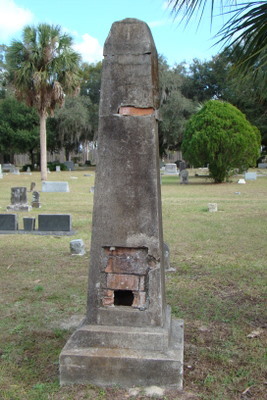 Interesting tombstone with hole in it.